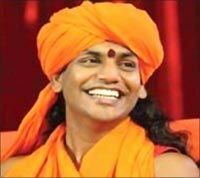 In a move that has ruffled many feathers, the Mahanirvani Akhara of 'naga' sadhus has conferred the honorific title of 'Mahamandaleshwar' on controversial self-styled godman Swami Nithyananda. "Swami Nithyananda is a prominent seer who has been taking part in all the Kumbh congregations. He was conferred with the title of Mahamandaleshwar at a ceremony held at our camp in the ongoing Kumbh Mela last night," Sachiv (secretary) of Mahanirvani Akhara Mahant Ravindra Puri told reporters Wednesday. The move was aimed at dispelling the notion that seers from the South were not given due representation in akharas, he said. Asked about the controversies surrounding the self-styled godman, Puri said "akharas believe in giving people an opportunity for redemption. "Moreover, the allegations against him are his personal matter and have nothing to do with the Mahanirvani Akhara." Reacting to the episode, Swami Narendra Giri of the Niranjani Akhara said the title of 'Mahamandaleshwar' is conferred in presence of representatives of all the 13 akharas. "In this case, the formality was not observed and hence conferring of the title can not be said to have been in order," he said. He, however, evaded a direct reply when asked about the propriety of conferring the title on the controversial godman. Meanwhile, the self-styled godman who had been staying in the Kumbh Mela for the past fortnight, has left for Varanasi, sources in the Mahanirvani Akhara said.